Will Untapped Ottoman Archives Reshape the Armenian Debate? The debate over what happened to Armenians in World War I-era Ottoman Anatolia continues to polarize historians and politicians. Armenian historians argue that Ottoman forces killed more than one million Armenians in a deliberate act of genocide. Other historians—most famously Bernard Lewis and Guenter Lewy—acknowledge that hundreds of thousands of Armenians died but question whether this was a deliberate act of genocide or rather an outgrowth of fighting and famine. In recent decades, the debate has shifted from academic to legislative grounds. In 2001, the French parliament voted to recognize an Armenian genocide. In 2007, U.S. political leaders narrowly averted an Armenian genocide resolution in the House of Representatives. While Armenian activists lobby politicians to recognize an Armenian genocide formally, which is likely to be a first step toward a demand for collective reparations, and genocide studies scholars seek to close the book on the Armenian narrative, it is ironic that many of the archives that contain documentation from the period remain untapped. 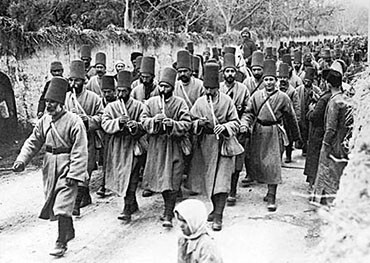 Ottoman soldiers march through a town. During World War I, Ottoman soldiers fought Russian troops in areas populated largely by Armenians. In 1989, the Başbakanlık Osmanlı Arşivleri (the Ottoman Archives division of the Prime Minister's Office) in Istanbul fully opened its doors to scholars regardless of their nationality or subject of research. The Ottoman Empire's central state archives originally consisted of two groups of documents: the records of the Imperial Council and of the Grand Vizier's office. From time to time, the state added other collections, for example, the records of the finance departments and the Cadastral Survey Office. The government registers include copies of the texts of imperial orders and decrees sent to provincial officials and judges and replies to reports from across the empire. They relate to questions of law and order, state revenues, military arrangements, foreign relations, administrative assignments, and other matters submitted for the sultan's consideration. Survey registers of rural and urban populations and their production convey figures and other information collected for administrative purposes. Likewise, there are specific registers dealing with the non-Muslim peoples of the Ottoman Empire, such as church registers and registers concerning other non-Muslim communities (millets). These run through World War I and contain valuable information on the question of Turkish-Armenian relations. There are approximately 150 million documents that span every period and region of the Ottoman realm in the stacks and vaults of the Ottoman Archives. Each day, new collections in these Ottoman archives are opened to researchers. All these extensive records are well preserved and organized. The first published catalog of Ottoman archival holdings appeared in 1955 and consisted of ninety pages of archival inventory and commentary. Archivist Attila Çetin followed in 1979 with a more extensive catalog, which is also available in Italian. As the classifying and organizing of the archives continued, the catalog grew. The 1992 edition is 634 pages long. The expanded 1995 compilation provides access to even more documents. Revised editions are to be forthcoming from time to time, as more detailed descriptions become available for the various fonds or individual record groups. Ottoman archival documentation constitutes an unequaled trove of information about how people lived from the fifteenth through the early twentieth centuries in a territory now comprised of twenty-two nations. İlber Ortaylı, director of the Topkapı Palace Museum at Istanbul, argues that the history of the Ottoman Empire should not be written without Ottoman sources. He is not alone in this. His position is buttressed by a number of specialists in the study of the Ottoman state and society. Albert Hourani, for example, the late British scholar of Middle Eastern affairs, argued that his best advice to history students considering Middle East specialization would be to "learn Ottoman Turkish well and learn also how to use Ottoman documents, since the exploitation of Ottoman archives, located in Istanbul and in smaller cities and towns, is perhaps the most important task of the next generation." There are few comprehensive sources about Armenian life in Anatolia outside of Ottoman archival sources. Diplomatic records, such as those cited by Armenian historian Vahakn Dadrian, as the basis for discussions among genocide scholars are spotty and intertwined with wartime politics. The Ottoman Ministry of the Interior (Dahiliye Nezareti) was the government department directing and supervising the relocation and resettlement of the Armenian population. The collection of the ministry documents covers the period from 1866 to 1922 and consists of 4,598 registers or notebooks. It is classified according to twenty-one subcollections, according to office of origin. Among the available documents in the Ottoman archives are several dozen registers containing the records of the deliberations and actions of the Council of Ministers, which set policies, received reports, and discussed problems that arose regarding the relocations and other wartime events. The minutes of its meetings, deliberations, resolutions, and decisions are bound in 224 volumes covering the years 1885 through 1922. These registers include each and every decree pertaining to the decision to relocate the Ottoman Armenians away from the war zones during World War I. The Records Office of the Sublime Porte (Babıali Evrak Odası) also contains substantial documentation, including the correspondence between the grand vizier and the ministries, as well as the central government and the provinces that can illuminate the events of 1915. The Ottoman archives remain largely unconsulted. When so much is missing from the fundamental source material, no historical narrative can be called complete and no conclusions can be balanced. If the Ottoman sources are properly utilized, the way in which the Armenian question is understood is bound to change. There is little explanation as to why more historians do not consult the Ottoman archives. They are open to all scholars. Bernard Lewis, Cleveland Dodge Professor Emeritus of Near Eastern Studies at Princeton University, who has worked extensively in the Ottoman archives since 1949, has argued that "the Ottoman archives are in the care of a competent and devoted staff who are always willing to place their time and knowledge at the disposal of the visiting scholar, with a personal helpfulness and courtesy that will surprise those with purely Western experience. [These records] are open to all who can read them." The late Stanford Shaw, Professor Emeritus of Turkish and Judeo-Turkish History at the University of California, Los Angeles, also spoke highly of the helpfulness of the archivists. He argued that the sheer amount of new material available removed any excuse for any scholar investigating various nationalist revolts not to spend time examining the new sources. Even Taner Akçam of University of Minnesota, one of the most vocal proponents of Armenian genocide claims, noted the improvement in the working conditions of the archives. In a recent article, he thanked the staff and especially the deputy director-general of state archives for their help and openness during his last visit. The archivists are now helpful to all researchers, not only those pursuing research which supports the Turkish government's line. The archives of the Turkish General Staff Military History and Strategic Studies Directorate in Ankara (Türkiye Cumhuriyeti Genelkurmay Askeri Tarih ve Stratejik Etüt Başkanlığı Arşivleri) provide a military perspective. Indeed, more than the Ottoman Archives in the Prime Minister's Office, this repository provides a rich trove of information about internal conditions in the empire, operations of the Ottoman army, and the Special Organization (Teşkilat-ı Mahsusa), somewhat equivalent to the Ottoman special forces, for the period 1914-22. The World War I and War of Independence archives alone number over five and a half million documents spread among Turkish General Staff Division reports and War Ministry files. Division 1 (Operations) contains military operations plans and orders, operations and situation reports, maps and overlays, general staff orders, mobilization instructions and orders, organizational orders, training and exercise instructions, spot combat reports. Division 2 (Intelligence) contains intelligence estimates and reports and orders of battle. Divisions 3 and 4 (Logistics) contain files concerning procurement, animals, munitions, transportation, rations, and accounting. The Ministry of War files contain the General Command's ciphered cables to military units as well as the papers of the infantry, fortress artillery, and other divisions. Vehip Pasha's Third Army (Erzurum), Jemal Pasha's Fourth Army (Damascus), and Ali İhsan Pasha's Sixth Army (Baghdad) are included among the staff files. These also include the Lightning Armies and Caucasian Armies groups. The cataloging and microfilming of the military archives repository up to the end of 1922 is complete. Once-secret documents should provide new information on the Armenian issue. In addition to the microfilmed documents, the Turkish General Staff Military History and Strategic Studies Directorate publishes volumes of documents from its collection, including Latin alphabet transliteration of all documents. The Turkish Historical Society (Türk Tarih Kurumu) at Ankara is also open to the public. The society houses private collections relating to strategy and political matters in the twentieth century, which include the papers of World War I-era war minister Enver Pasha together with those of his chief aide-de-camp and brother-in-law, Kazım Orbay. The Enver Pasha collection, donated in 1972 by his daughter Mahpeyker Enver, consists of 789 single, disparate items of handwritten notes, memoranda, reports, military records, cards and invitations, dispatches, letters of appreciation of colleagues and opponents, photographic albums, topographic maps, charts, private correspondence, diaries, and miscellany for the period 1914-22. There are no restrictions on access to these. Because in the early decades of the twentieth century it was customary for officials to keep their papers upon their departure, these remain a relatively rare resource. Orbay's papers add additional insight because they enable historians to gauge which issues most occupied the Ottoman Empire's highest ranking military official of the time. Few scholars have used this last collection perhaps because they remain unaware of it. The National Library (Milli Kütüphane) at Ankara houses thousands of Muslim court records, most of which were transferred from local museums and offices scattered around Turkey. These records contain a vast array of information concerning imperial administration, city government, the affairs of townspeople and villagers and deal with almost every aspect of the lives of the subjects be it personal status, taxes, loans, sales, price regulations, complaints, flight, or theft. Any matter requiring official resolution, registration, verification, or adjudication was potentially the domain of the Muslim judge (kadı) even when the matters applied to non-Muslims, such as Armenian Christians. Many Turkish historians have employed Muslim court records extensively for Anatolian regional studies, but they remain relatively untapped by Armenian historians. Sole reference to Ottoman archives will not and should not satisfy historians; a full study of the Armenians during World War I should consider material from all sides in a conflict. The Armenian community maintains a number of archives. The archives in Watertown, Massachusetts, contain repositories from the Dashnak Party (Dashnaksutiun, the Armenian Revolutionary Federation) and the First Republic of Armenia. Both of the above together with the archives of the Armenian patriarchate in Jerusalem and the Catholicosate, the seat of the supreme religious leader of the Armenian people, in Echmiadzin, Armenia, remain closed to non-Armenian researchers. Tatul Sonentz-Papazian, Dashnakist archivist, for example, denied İnönü University scholar Göknur Akçadağ access to the Watertown archives in a June 20, 2008 letter. Dashnaksutiun archives are also not available to those Armenians who do not tow the party line. Historian Ara Sarafian, director of the Gomidas Institute in London, complained that "some Armenian archives in the diaspora are not open to researchers for a variety of reasons. The most important ones are the Jerusalem Patriarchate archives. I have tried to access them twice and [been] turned away. The other archives are the Zoryan Institute archives, composed of the private papers of Armenian survivors, whose families deposited their records with the Zoryan Institute in the 1980s. As far as I know, these materials are still not cataloged and accessible to scholars." Beyond the closure of Armenian archives to non-Armenian and even to some Armenian scholars, few of these allow the public to access catalogs detailing their holdings. Many scholars writing on the Armenian question utilize Britain's National Archives (formerly the Public Record Office) in Kew Gardens. While the British government has made available many of their diplomats' reports for study, much material from the British occupation of Istanbul (1919-22) and elsewhere in Anatolia following World War I remains closed to researchers under the Official Secrets Act and are only partially available in the archives of the government of India in Delhi. British authorities say they remain sealed for national security reasons. Their release should be important to historians as they will include evidence regarding returning Armenian refugees and other related matters. Files of the British Eastern Mediterranean Special Intelligence Bureau also remain closed, perhaps because the British government does not wish to expose those who may have committed espionage on behalf of Britain. These are important because they should enable historians to research British espionage and sabotage, demoralizing propaganda, and attempts to provoke treason and desertion from Ottoman ranks during and immediately after 1914-18. The documents of the Secret Office of War Propaganda, which under the direction of Lord James Bryce and Arnold Toynbee developed propaganda used against the Central Powers during World War I, also remain sealed. Their opening will allow historians to assess whether British officials in the heat of war created or exaggerated accounts of deliberate atrocities. History cannot be decided by politicians weighing either constituent concerns or emotions more than evidence. Nor should the debate on history be closed while the existing narrative utilizes only a small portion of the source material. The same holds true not only for Armenian historians but also for their Turkish counterparts and others. Rather, historians should work together to consider all source material, both in Armenian and Turkish archives. Each should be open fully. Cherry-picking documents to "prove" preconceived ideas and to ignore documents that undercut theses is poor history and, in a politicized atmosphere, can do far more harm than good. I think that these historical circumstances require a very detailed and sober look from historians. And what we've encouraged the Turks and the Armenians to do is to have joint historical commissions that can look at this, to have efforts to examine their past, and in examining their past to get over their past. It is unfortunate that the Armenian government has failed to accept the joint commission, for without joint consideration of all evidence, the wounds of the past will not heal and, indeed, when an incomplete narrative enters the political realm, the consequences can be grave. Yücel Güçlü is first counselor at the Turkish Embassy in Washington, D.C. The views expressed in this article are the author's own and do not necessarily reflect those of the Ministry of Foreign Affairs of the Republic of Turkey. See, for example, Vahakn N. Dadrian, The History of the Armenian Genocide (Providence: Berghahn Books, 1995), p. xviii. Bernard Lewis, professor of Near Eastern Studies at Princeton University, to Shaike Weinberg, director of the Holocaust Memorial Museum, Princeton, N.J., Oct. 11, 1991, United States Holocaust Memorial Museum Archives, Director of the Museum: Subject Files of Jeshajahu 'Shaike' Weinberg, 1979-1995, Box: 7; Bernard Lewis, Semites and Anti-Semites: An Inquiry into Conflict and Prejudice (New York and London: W.W. Norton and Co., 1986), p. 21; Bernard Lewis, The Middle East: A Brief History of the Last 2,000 Years (New York: Scribner, 1995), pp. 339-40; Guenter Lewy, The Armenian Massacres in Ottoman Turkey: A Disputed Genocide ( Salt Lake City: The University of Utah Press, 2005), pp. ix, xii; Guenter Lewy, "The First Genocide of the 20th Century?" Commentary, Dec. 2005, p. 51; Guenter Lewy, "Revisiting the Armenian Genocide," Middle East Quarterly, Fall 2005, pp. 3-12. BBC News, Jan. 18, 2001. Yusuf Sarınay, "Türk Arşivleri ve Ermeni Meselesi," Belleten, Apr. 2006, pp. 291-310; Metin Coşgel, "Ottoman Tax Registers (Tahrir Defterleri)," Historical Methods, Spring 2004, pp. 87-100. Murat Sertoğlu, Muhteva Bakımından Başvekalet Arşivi (Ankara: Ankara Üniversitesi Dil ve Tarih-Coğrafya Fakültesi Yayınları, 1955). Attila Çetin, Başbakanlık Arşivi Kılavuzu (Istanbul: Enderun Kitabevi, 1979). Yusuf Ihsan Genç et al., Başbakanlık Osmanlı Arşivi Rehberi (Ankara: Başbakanlık Basımevi, 1992); Mustafa Küçük et al., Başbakanlık Osmanlı Arşivi Katalogları Rehberi (Ankara: Başbakanlık Basımevi, 1995); Ilber Ortaylı, "Başbakanlık Arşivinin 1995 Yılı Yayınları Üzerine: Verimli Bir Yılın Değerlendirilmesi," Türkiye Günlüğü, Jan.-Feb. 1996, pp. 217-21. Ilber Ortaylı, Osmanlı Barışı (Istanbul: Timaş Yayınları, 2007), pp. 217-29; idem, Osmanlıyı Yeniden Keşfetmek (Istanbul: Timaş Yayınları, 2006), p. 124. Nancy Gallagher, ed., Approaches to the History of the Middle East: Interviews with Leading Middle East Historians (Reading: Ithaca Press, 1994), p. 43. Lewy, "Revisiting the Armenian Genocide." Genç, Başbakanlık Osmanlı Arşivi Rehberi, pp. 384, 352. Jeremy Salt, "The Narrative Gap in Ottoman Armenian History," Middle Eastern Studies, Jan. 2003, p. 35. Bernard Lewis, "The Ottoman Archives as a Source for the History of the Arab Lands," Journal of the Royal Asiatic Society, Oct. 1951, pp. 139-55; idem, From Babel to Dragomans: Interpreting the Middle East (Oxford and New York: Oxford University Press, 2004), pp. 418-9. Stanford Shaw, Studies in Ottoman and Turkish History (Istanbul: The Isis Press, 2000), p. 600. Stanford Shaw, "New Research Opportunities in the Ottoman Archives of Istanbul," Belleten, Aug. 1994, p. 465. Taner Akçam, "Deportation and Massacres in the Cipher Telegrams of the Interior Ministry in the Prime Ministerial Archive (Başbakanlık Arşivi)," Genocide Studies and Prevention, Dec. 2006, pp. 320-1, ftnt. 6. Türkiye Cumhuriyeti Genelkurmay Askeri Tarih ve Stratejik Etüt Başkanlığı Arşivleri (ATESE), Genelkurmay Başkanlığı Harp Tarihi Dairesi Tarihçesi (HTDT), 1961, folder: 1, file: 1, no. 1-14. Author interview, Colonel Ahmet Tetik, chief of the archives division of the Turkish General Staff Military History and Strategic Studies Directorate, July 11, 2008; ATESE, HTDT, 1961, folder: 1, file: 7, no. 1-15; on the importance of the Ottoman military archival sources, see Edward Erickson, "The Turkish Official Military Histories of the First World War: A Bibliographic Essay," Middle Eastern Studies, July 2003, pp. 190-8. Türkiye Cumhuriyeti Genelkurmay ATESE ve Denetleme Başkanlığı Yayın Kataloğu (Ankara: Genelkurmay Basımevi, 2005). See, among others, Arşiv Belgeleriyle Ermeni Faaliyetleri, 1914-1918, vols. 1-8 (Ankara: Genelkurmay Basımevi, 2005-2008). Justin McCarthy, Conference on the Reality of the Armenian Question (Ankara: Türkiye Büyük Millet Meclisi Basımevi, 2005), p. 57. Edward Erickson, "Armenian Massacres: New Records Undercut Old Blame," Middle East Quarterly, Summer 2006, pp. 67-75; Tuncay Öğün, Kafkas Cephesinin Birinci Dünya Savaşındaki Lojistik Desteği (Ankara: Atatürk Araştırma Merkezi, 1999). "1972 Yılı Çalışma Raporu," Belleten, July 1973, p. 425. Uluğ Iğdemir, Cumhuriyetin 50. Yılında Türk Tarih Kurumu (Ankara: Türk Tarih Kurumu Basımevi, 1973), p. 51; Fahri Çoker, Türk Tarih Kurumu: Kuruluş Amacı ve Çalışmaları (Ankara: Türk Tarih Kurumu Basımevi, 1983), p. 143. Mahmut Şakiroğlu, "La bibliothèque nationale d'Ankara," Turcica, 20 (1988): 243-6. The best descriptions of the contents of Turkish Muslim court records series and its various uses for historiography thus far to appear have been Ahmet Akgündüz's Şer'iye Sicilleri: Mahiyeti, Toplu Kataloğu ve Seçme Hükümler, 3 vols. (Istanbul: Türk Dünyası Araştırmaları Vakfı Yayınları, 1988); Amy Singer, "Tapu Tahrir Defterleri ve Kadı Sicilleri: A Happy Marriage of Sources," Tarih, 1(1990): 95-125. For insightful discussions on the importance of Muslim court records see Halil Inalcık, "Ottoman Archival Materials on Millets," in Benjamin Braude and Bernard Lewis, eds., Christians and Jews in the Ottoman Empire: The Functioning of a Plural Society, vol. 1 (New York and London: Holmes and Meier, 1982), pp. 437-49; Cahid Baltacı, "Şer'iye Sicillerinin Tarihsel ve Kültürel Önemi," Osmanlı Arşivleri ve Osmanlı Araştırmaları Sempozyumu 17 Mayıs 1985 (Istanbul: Türk-Arap Ilişkileri Incelemeleri Vakfı, 1985), pp. 127-32; Jon Mandaville, "The Jerusalem Shari'a Court Records: A Supplement and Complement to the Central Ottoman Archives," in Moshe Maoz, ed., Studies on Palestine during the Ottoman Period (Jerusalem: The Magnes Press, the Hebrew University, and Yad Izhak Ben-Zvi, 1975), pp. 517-24; Amy Singer, Palestinian Peasants and Ottoman Officials Rural Administration around Sixteenth-Century Jerusalem (Cambridge and New York: Cambridge University Press, 1994), pp. 20-1. Ara Sarafian, "Génocide arménien et la Turquie," Nouvelles d'Arménie, Sept. 2008, p. 1. Anatolian News Agency, Apr. 11, 2005. For an appraisal on the subject, see "Turkey and Armenia: When History Hurts," The Economist, Aug. 6-12, 2005, p. 26. "President's Statement on Armenian Remembrance Day," The White House, Office of the Press Secretary, Apr. 24, 2005. Congressional transcripts, United States House of Representatives, Appropriations Subcommittee on State-Foreign Operations, Mar. 21, 2007; Associated Press, Mar. 21, 2007; United Press International, Mar. 21, 2007. Related Topics: History, Turkey and Turks | Yücel Güçlü | Spring 2009 MEQ receive the latest by email: subscribe to the free mef mailing list This text may be reposted or forwarded so long as it is presented as an integral whole with complete and accurate information provided about its author, date, place of publication, and original URL.